How to start a worm business? Hello I'm from Israel and just found out about this amazing stuff called worm farming... I work in a greenhouse but its not mine. So I thought about building a business.. I know personally people that are owning all kinds of farming like cattle,poultry,sheep...etc. as I mentioned I work big greenhouse tunnels and get paid well but the problem is that I work my hours everyday and it doesn't satisfy me that its not my own business... So i thought a lot about opening a garden related business of my own... A worm business would be a new thing in my area and I think I wouldn't have to much competition from other farmers. So I wondered if you could help me to get started and tell what i need to do to get my worm business of the groung? Would it be good to start one? I am a little confused about this.. I have about 3000 square meters of land to work with and think its a good way to start something of my own. I have enough money to start a business. So any help you could offer will be appreciated. Hello I am sure that a worm business might be a good way to become your own boss especially as you have already worked in a farming related business. It's growing in popularity in many parts of the world. 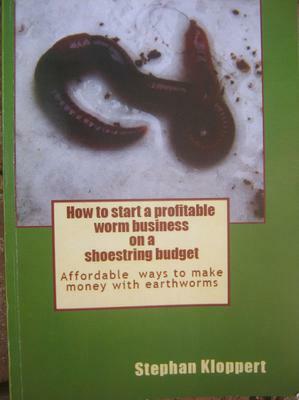 I believe the best way to get started would be if you would buy yourself a copy of my book "How to start a profitable worm business on a shoestring budget" In the book I share my own experiences on how to start a worm business from scratch. All you need to get going is in the book and I am confident that it will be worth the small investment. Have a look at the link below to read what actual customers had to say about the book. I wish you all the best and God's blessings.